Temporary installations yield the opportunity to enrich existing spaces for a short time with new content and significance. 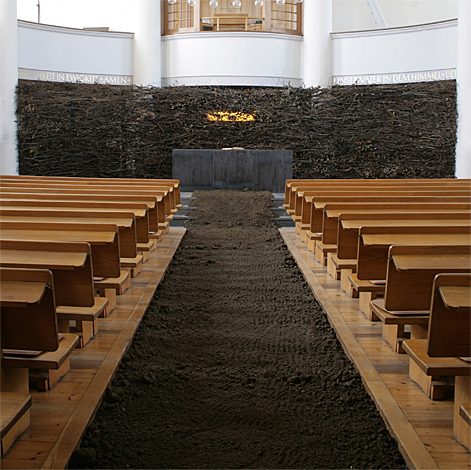 For two months in 2012 an installation by Madeleine Dietz gave new meaning to the middle section of the oval worship space of the Lutheran Twelve-Apostles-Church in Frankenthal, Germany. Instead of a red carpet, brown earth filled the path from the entrance of the church to the altar in the middle of the worship space. 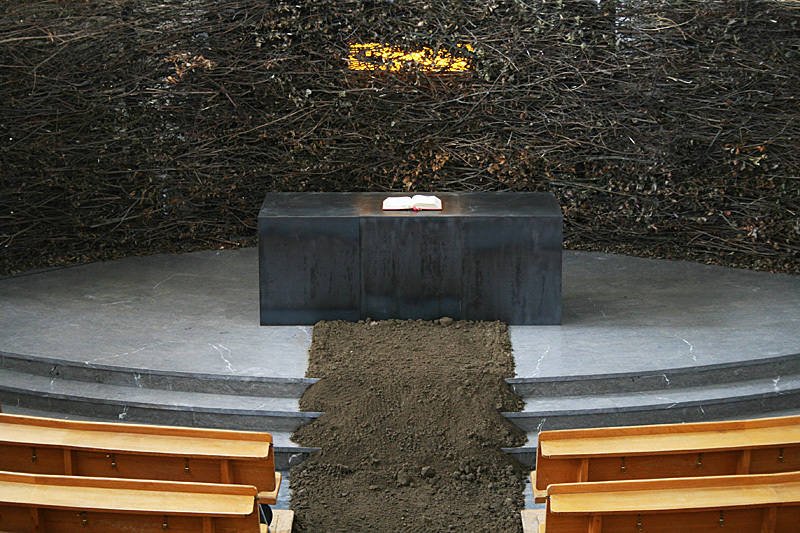 Put over the altar was a dark steel cube that contrasted with the soft soil in front of it and the branches behind it. With these thorn branches the artist made a fence that was about 50 cm thick, which blocked the entrance to the back of the choir. Because of their formal similarity (colour and dimension) the earthen pathway and the fence together formed a cross with its intersection located at the altar. Out of the wattled branches a horizontal yellow light shone out across the matt surface of the altar suggesting a presence of light at the other side of the partition. The installation ‘earthed’ the functional meeting space and at the same time gave it a spiritual orientation. The dry dirt made the important path leading to the altar impassable. In this way Madeleine Dietz created a ‘holy’ space in the midst of the believers, which they could not enter. With simple soil the artist alluded to all of creation and the vulnerability and transitoriness of human life. The path of earth interrupted the automatic movements of the believers and forced them to opt for new ways: a symbolic admonition to also do this in their faith and to keep moving in new directions. The sawn branches of the fence of thorns testify to the growing power of plants and trees. As full-grown shoots they carry the marks of life, even if all the sap has left them. It makes them symbolize the fullness as well as the brevity of life. The thorns represent the suffering connected to the latter. They also refer to the suffering and death of Christ. While endless potential is present in the earth, the thorny screen stands for the finiteness of life, for the impenetrable boundary which we can only cross by faith. The fence, after all, is not a closed wall, but little glimpses of light shine through. If the soil suggests the transitory nature of life but also its potentially fruitful existence, then the thorny fence stands for the end of our earthly life. It separates us from a life after this life, which in the installation manifested itself as a hard to discern ‘behind’. While the altar symbolizes our focus on God and the spiritual restoration during our path through life, the yellow light refers to life eternal. The light makes us aware of a light-filled, warm and promising presence at the other side of the fence, exactly when it starts to become dark and cold around us and we have to let go of everything that is dear to us. It strengthens our faith in the resurrection and that God will take care of us at the hour of our death, leading us to the light and making us taste life in all its fullness. Madeleine Dietz: So that, Whoever Enters, Sees the Light, 2012, installation with branches, earth, light and a cube of steel. 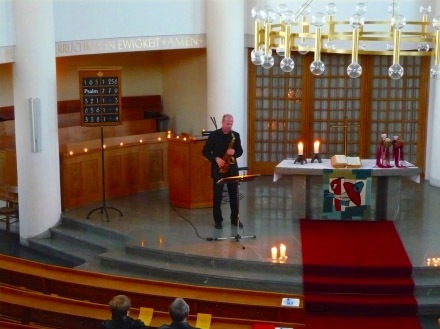 In May and June 2012 this work was installed in the Lutheran Twelve-Apostles-Church in Frankenthal (near to Mannheim), Germany as part of the project ‘God and the World’ for the Culture Summer Rheinland Pfalz.